The newly revamped Los Angeles Lakers team have struggled to close out games in the beginnings of their season. With a 0-3 start to their highly anticipated year, it is evident that they are experiencing mental lapses in the late game. 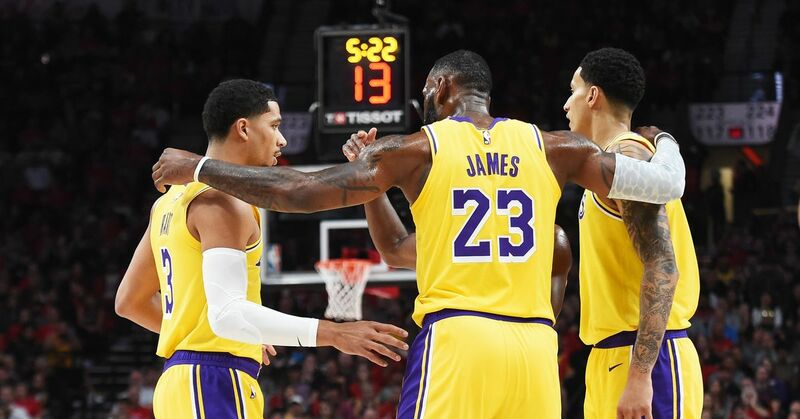 The Lakers paid the Portland Trailblazers a visit for their first game of the season. Despite going 7-for-30 from the deep, the Lakers willed their way to a close game by dominating in paint points. It was not until the fourth-quarter that the Lakers would suffer from not finishing from beyond the arc. The Trail Blazers managed to outscore the Lakers 35-28, resulting in a 128-119 in the Lakers debut. Two nights later, the Lakers resumed action in Los Angeles for their home opener against the Houston Rockets. What could have been a potential win for the Lakers, took a turn for the worse when a fourth quarter brawl erupted. Brandon Ingram was whistled for a foul call against James Harden, (he thought it was a bad call and instead was a flop on Harden). Ingram proceeded to shove Harden out of frustration. 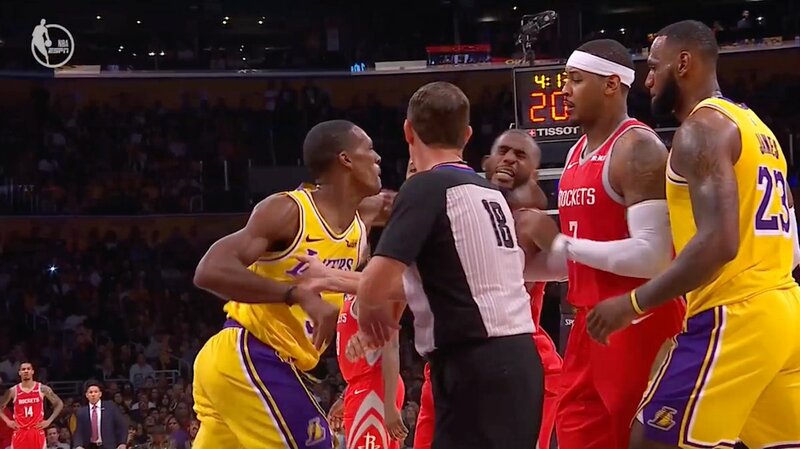 His actions translated to a heated talk between Rajon Rondo and Chris Paul, where the two began throwing blows before being separated. All three were ejected for the remainder of the game and would face suspensions. Furthermore, the Lakers trailed by one point with 4:13 left to go when the tension between the two teams surfaced. Harden had his way in the remaining four minutes of the contest, powering his team to a 124-115 win over the Lakers. In a fierce matchup against the San Antonio Spurs, Kyle Kuzma and Lonzo Ball took over the starting duties in the absence of Rondo and Ingram. Kuzma was merely unstoppable as he led the Lakers with 37 points on 15-for-25 shooting. Had the Lakers put an emphasis on limiting second-chance opportunities in the late going, the game could have gone either way. JaVale McGee’s missed block out assignments on LaMarcus Aldridge did not completely ruin the game, but it could have helped the Lakers secure a win in regulation (again, the little things folks). The same LeBron that rattled home a triple in order to send the game into overtime, was the same LeBron that went 0-for-2 from the free throw line with 12.8 seconds to go in the game. After an empty trip to the line for the Lakers, Patty Mills answered with a quick 2 for the Spurs, giving them a 143-142 advantage. Not yet defeated, LeBron took it in his hands to take the last shot of the game. James would miss his highly contested step back jumper, putting the Lakers at a 0-3 slate. It is not like LeBron to miss at the line during a crucial point in the game, but again it’s the little things that make good teams great. The Lakers will have to grasp this concept if they plan on being the team that they are worthy of being this season. On any given night any player on the Lakers roster can go off from a scoring standpoint. Their problems are way smaller than that: closing out games, keeping opponents off the glass, and working as a unit on defense will wipe away their troubles. feeling I discovered exactly what I needed. I so much definitely will make sure to don?t fail to remember this website and provides it a look regularly. or e-newsletter service. Do you have any? Please permit me recognize so that I may just subscribe. weblog is in fаact remarkable. to do not fail to remember this web site and give it a glance regularly. Ԍreetings! Very helpful advice in tһis partіcular article! It is the littҝe cһanges which will mqkｅ the biggest changes. Excellent, what a weblog it is! This webpage presents helpful data to us, keep it up. The clarity on your submit is simply great and that i could think you are an expert in this subject. Hey tһere! Would you mind if I sharе your blog with my twitter group? There’s a lot of people tat I think would rеally enjoy your content.Pleaѕe let me know. next articles relating to this article. I want to read even more issues about it! If you wish for to increase your experience only keep visiting this website and be updated with the hottest news posted here. short for novices. Could you please extend them a bit from subsequent time? I realized it’s new to me. Regardless, I’m definitely pleased I discovered it and I’ll be bookmarking it and checking back regularly! a blog but I do write in my diary everyday. Howdy very cool site!! Guy .. Excellent .. Superb ..
to…HaHa). You certainly put a new spin on a topic that has been written about for years. just too wonderful. I actually like what you have acquired here, certainly like what you’re stating and the way in which you say it. will send this article to him. Fairly certain he’s going to have a very good read. What i don’t understood is in truth how you’re now not really a lot more smartly-appreciated than you may be now. it from numerous varied angles. Its like women and men don’t seem to be interested unless it’s something to do with Lady gaga! Hello to all, it’s in fact a good for me to visit this site, it includes important Information. daily by reading thes pleasant content. I have been surfing online more than three hours these days, yet I by no means found any interesting article like yours. good content material as you did, the net will likely be a lot more helpful than ever before. getting more from this web site, and your views are fastidious for new visitors. that in favour with the better odds provided by the European roulette wheel. If you play small stakes then you can definitely like a large amount of hands to your money.